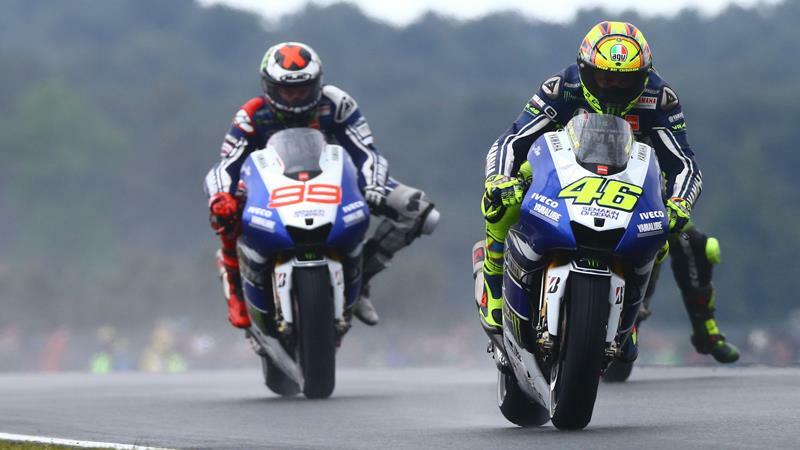 Valentino Rossi saw his bid for a second rostrum finish of 2013 slip away in a rain-hit Le Mans MotoGP race after the Italian crashed out while lying in fourth position. The 34-year-old was trying to keep Monster Yamaha Tech 3 rider Cal Crutchlow in his sights when he lost the front-end in the braking zone for Turn 6 on lap 18. Despite extensive damage to his front brake lever he was able to remount and finish 12th but the nine-times world champion admitted he had let a golden chance to take a podium slip from his grasp. Rossi, who is already 36-points adrift of Le Mans winner Dani Pedrosa in the early title chase, said: “It is a pity because I have a good chance for a good result and maybe the potential to arrive on the podium. Until that moment the race was very good and I enjoy a lot. I did a good start and I had a good setting on the bike and I pushed and in was strong in braking and also acceleration was not so bad so I can fight with the other guys. Prior to his mistake, Rossi had lost third place to Crutchlow on lap 14 but was confident he could have counter attacked later in the race, despite the British rider’s impressive charge through the field from seventh. Rossi also revealed after the 28-lap race his frustration with a misting visor on his AGV helmet. The problem was improved from 2012 when he also struggled with his visor steaming up but he said the situation still clearly needed to be looked at by AGV for future wet races. He said: “Unfortunately I have some problem with the visor and I can’t stay close to the guy in front because I have a problem with the water. I race with this helmet from last year and I always have a lot of problems with the fog when it is wet. Last year here in the race I had a lot of problems and I had to open the visor and also in Malaysia. For seven pages of coverage from the Le Mans race, see the May 22 issue of Motor Cycle News.